This week as Virginia Supportive Housing celebrates National Volunteer Week, I reflect with gratitude on the impact volunteers make on our organization and in the lives of those we serve. The collective contributions of volunteers are inspiring. In the last five years, 5,513 volunteers supported our mission to end homelessness with gifts of time, skills and compassion. Volunteers provided nearly 47,800 hours of service, which translates to an extraordinary $987,000 in value. These numbers only capture part of the picture. VSH’s volunteer workforce supports all aspects of our mission and extends our ability to deliver critical services to vulnerable individuals. Volunteers help improve the quality of life for the residents, whether by enhancing and maintain the properties in which they live, or by providing direct services and activities to our residents. VSH’s portfolio of apartments for formerly homeless individuals includes 535 units in 16 properties that we own and operate. Volunteers greatly expand the capacity of our maintenance team, thanks to thousands of hours that they dedicate to VSH. As a result, VSH properties look more attractive, clean and inviting – like “home” should be. Volunteers construct fences, repair porches, spread mulch, paint apartments, repair appliances, plant flowers, clean gutters, move furniture, scrub sinks, cut grass, build raised garden boxes, rake leaves, assemble furniture and paint parking lot lines, among many other tasks. The work is not glamorous, but our volunteers unfailingly arrive with team spirit and can-do attitudes to make it seem like fun. Through VSH’s orientation and training, volunteers gain an understanding of the variety of physical and mental conditions that affect many of our residents as a result of having living unsheltered for years. Volunteers also learn about residents extremely limited incomes (less than $10,000/year) that can affect food security and social inclusion. Many of our residents are also disconnected from family, thus reducing their exposure to holiday celebrations and traditions. Volunteers have answered the call to help improve the quality of life for our residents in a big way. Direct services that volunteers provide include hosting birthday parties, cutting hair, preparing dinners, decorating for holiday celebrations, teaching computer skills, conducting art classes, leading Bingo, teaching financial literacy, providing assistance with job-hunting, promoting wellness, performing song and dance routines, conducting Bible studies, organizing Wii fitness sessions, teaching bike safety and delivering food baskets. Special event volunteers support myriad fundraising efforts while administrative support volunteers and interns support our administrative staff. Without the contributions of volunteers across all departments and programs, we would not be able to accomplish the important work that we do each day to end homelessness. Volunteers are truly the KEY to success! National Volunteer Week provides not only a great opportunity reflect, but to plan as well. This year VSH will become certified as a Service Enterprise, which means that our capacity to engage volunteers strategically, to onboard them effectively and to steward them as life-long supporters will be better than ever. We are committed to strengthening our current practices while striving for a new level of excellence in volunteer engagement. On behalf of Virginia Supportive Housing’s staff, Board of Directors and residents, I extend our sincere appreciation and gratitude to all volunteers. Your dedication and service are priceless. Here’s to volunteers and the bright futures they continue to build! Chances are you’ve seen him. For more than two years, Mr. X has been a fixture at a major downtown underpass, gesticulating wildly to himself, vaguely menacing, unapproachable. Every city has its own Mr. X. The individual considered most likely to decline outreach, most resistant to housing and services, the Mt. Kilimanjaro of the homeless services providers system. In New York, you find these individuals in The Bowery. In Los Angeles, they reside at Skid Row. In New Orleans, it was the legendary Mr. Coleman. In Richmond, agreement was unanimous that it was Mr. X. When the announcement was first made back in April of 2011 that the state of Virginia intended to join the national 100,000 Homes Campaign and that Richmond, led by Homeward and Virginia Supportive Housing, would be the vanguard city, VSH received multiple e-mails from concerned citizens wondering if Mr. X would be outreached. At the time, it was not at all clear that he would – or could – be helped. Mr. X wasn’t always this way. With several years of college on his resume, he was clearly intelligent and had the potential to be as functional and productive as you or me. However, as we all know, sometimes it only takes one tough episode to send a life careening off the tracks. Mr. X’s descent into mental illness and subsequent homelessness was apparently rapid, but not beyond treatment, if only someone cared enough. The VSH support services staff became officially acquainted with Mr. X last August during Richmond Registry Week. Multiple survey teams approached him that week, but he declined to cooperate each and every time. And yet, he clearly met the survey criteria of chronically homeless and medically vulnerable, especially on the basis of mental health concerns. In fact, on one occasion, VSH’s HomeLink Team Leader Lynn Aumack offered to bring him coffee and he refused, suspecting that it would be poisoned and threatening to “cut off the head of the Dalai Lama” if “the people in the red shirts” didn’t stop coming around. Despite his erratic behavior, VSH staff continued to try to connect with him over the next several months. Mr. X’s symptoms were so severe that it was extremely difficult to build rapport, and he declined all offers of housing and services repeatedly. On at least two occasions the Richmond Police Department’s HOPE team and RBHA (Richmond Behavioral Health Authority) Crisis team were called in for an assessment, but both times the conclusion was that he did not meet the necessary criteria for involuntary hospitalization. Lynn didn’t give up, though, and saw an opportunity at the beginning of June that resulted in another Crisis team assessment. This time, the outcome was that Mr. X was admitted for inpatient psychiatric treatment. With medication, Mr. X’s symptoms improved rapidly and he was able to engage with an APTS (A Place To Start) team member with the result that he agreed to move into permanent housing! On very short notice and in the hospital, the APTS team was able to rapidly process his intake into that program and finalize his housing placement. Less than a week later, Mr. X moved into his apartment where APTS staff continued to provide him with intensive services. Recently, Mr. X appeared clean-shaven and neatly dressed in the offices of VSH headquarters, working with case managers to sort out his benefits. And, best news of all, Mr. X has been reunited with relatives and will soon return to his hometown to recover with the support of his family. And it all started with housing. As VSH clinical services director Kristen Yavorsky remarked, all it took was someone driven by the conviction that he deserved better than a life under the bridge. This blog was written by Georgi Fisher, case manager for HomeLink, a program of Virginia Supportive Housing. For as long as I’ve worked in social work, I’ve had a difficult time grasping the idea of “housing readiness.” The idea behind housing readiness is that a person who is homeless should first conquer his or her demons and prove that they are ready for and, have in turn, earned the right to housing. While most homeless programs have operated off of this philosophy, this premise is one that homeless service providers have wrestled with for years. I’m not sure about you, but no one ever made me prove my ability to cook, clean, never make poor decisions, pay bills on time, and be the overall picture of perfection before they allowed me to have a roof over my head . If they had, I’m more than sure that I would never have been granted access to an apartment during my 20’s and probably never would have been given a house in my 30’s. 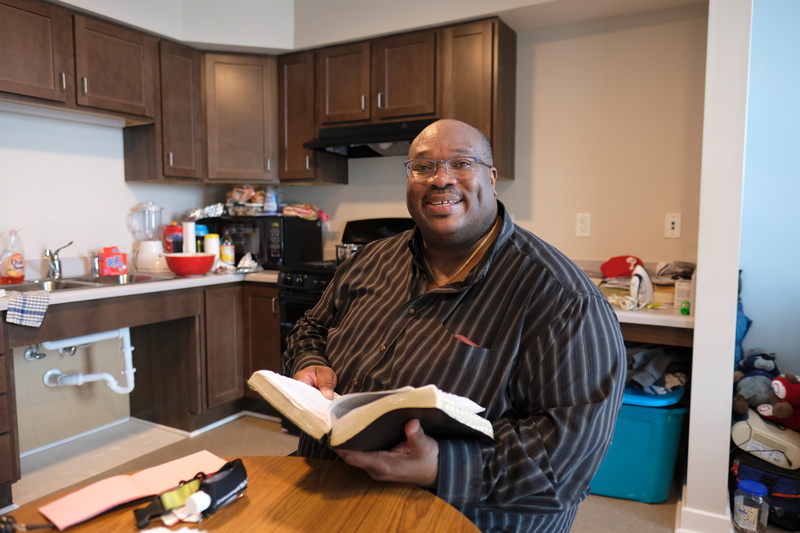 Virginia Supportive Housing subscribes to the “housing first” model, which focuses on bringing people directly from the street and into their own apartment. In this model there is not a period of transition from the street to a shelter, from a shelter to a transitional program, and from a transitional program to an apartment where a person has to earn their right to permanent housing. Here, the primary focus is to put an individual into permanent, stable housing right away. And this is where my role at Virginia Supportive Housing comes in. My name is Georgi and I was hired to work as a case manager for a brand new program within Virginia Supportive Housing called HomeLink. The HomeLink Program is one that was started to identify and house those most at risk of dying on the street. Since I first began to work with this program, many people have asked me why we put people into housing without asking them to clean up their credit, get a job, stop using drugs, follow directions, or otherwise be perfect. In the beginning it was difficult to answer this question, other than by just saying “because it’s right.” And then I met John. John was one of my first client’s in the HomeLink Program and our first meeting was in the downtown Social Services building. I walked into the room and was met by a frail younger man wearing a heavy army coat and a hat that was pulled down over his eyes. The distinct odor of days without access to a shower and alcohol met me as I pulled a chair next to him. I introduced myself and John, without saying a word, slowly looked me up and down with a skeptical look on his face. He then said, “You and I aren’t going to get along.” Trying not to look taken aback, I smiled and said that was ok. The conversation didn’t necessarily go well from there. John was skeptical about my program and the fact that I was offering him housing with no strings attached. Several times during the first meeting he got up to walk away and I gently coaxed him back into the chair to talk with me. After an hour passed, we wrapped up our conversation and I asked John if he would want to go look at an apartment. He again looked at me with a bit of shock and skepticism, but advised that he did want to look at an apartment and we agreed to meet the next morning at a corner he liked to hang out at downtown. The next day arrived and I pulled up to the corner to find my new client even more frail than the day before. His thin body was no longer wrapped in a heavy coat and the skeletal outline of his body was shocking. John seemed a bit more relaxed and opened up to tell me more about his history. He explained that he had been on the street for nine years and that he had been battling addiction. He also disclosed that, because of his addiction, he had burned many bridges with people in his life and that he had made the decision to separate from friends and family in an effort to protect them from further hurt. The shame was glaringly evident as he spoke quietly in the car next to me, head down and gaze pointed at the floor board of our van. After looking at an apartment, we set a date for John to move in just a couple of weeks away. He was quiet, but excited, and still a bit skeptical. As I was driving him back to the place where he would spend his days, he disclosed that he had been feeling quite ill for weeks but did not want to go to the hospital. John, I knew, had AIDS and had, many times in the past, battled serious illness as a result of being on the street and not accessing proper nutrition or medical care. I offered to take him to the hospital to be looked at but he declined, saying that he did not like hospitals. I gave him my card and told him to call me if he changed his mind. Several days passed and John continued to decline to go to the hospital. Then, one night, right before I was leaving the office, I received a phone call from him saying that he would go. I immediately drove to pick him up but as we reached the hospital he, again, changed his mind. I offered to buy him a Frosty from Wendy’s and sit with him in the Emergency Room while he was evaluated. Looking surprised, he agreed and there we sat for hours, waiting for him to be seen. There were many strange looks as people walked by and saw me, dressed in my work clothes and John, dressed in his dirty army coat and stocking cap, sharing dinner and conversation together. I imagine that John knew, in his heart, that if he went to the hospital he might never get to come back home. He had battled with severe pain and nausea for weeks but never wanted to go to the hospital because of fear of the unknown, denial, and, on a deep level, fear about how people would treat him knowing that he was homeless, an alcoholic, and HIV positive. John was admitted into the hospital that evening and, for the next two months, he remained there. Battling sepsis, an infection in the blood, and meningitis, John lay weak and in pain in his hospital bed. Every day I, or one of the two social workers on my team, would go and sit with John. We would talk about the weather, about his day, about his illness, about his hopes to go to his new apartment, and, toward the end, about the many joys and many regrets that he had about his life. Always with gratitude, John began to open up about his life. He shared about his long-term relationship with a young woman and the three beautiful children that had come out of that relationship. He shared about how he and his partner battled addiction, he to alcohol and her to heroin, and how their youngest son was born addicted to drugs. He shared the guilt that he and his partner fought with daily about his son’s exposure to drugs. John then shared that their baby boy passed away at just 31 days old due to birth defects caused by his partner’s substance abuse. He spoke about the deep rift that his son’s death had left in his family and how, a few months after the baby’s death, his partner had left him a note apologizing for harming their son and explaining her deep sadness. He found that note and his partner after she killed herself. He described the panic, the despair and the anger that he felt, now being alone with two children. It was there, he explained, that his addiction took a dramatic turn and there that he began to lose touch with the world. Several weeks after our first meeting, I found myself sitting in John’s hospice room, gently washing and shaving him with another social worker from my team. John was unconscious, now in a coma state, but it was a final act to bring dignity to a man who so many had looked past or given up on. We played Teddy Pendergrass, his favorite musician, on a CD player next to his bed, changed him into a clean gown, and tucked him into fresh linens. For many people, these steps would be carried out by family members enjoying the last moments with their loved one. But for many other people, these moments wouldn’t be shared with anyone. For our clients, their last moments would have been alone, under a bridge or in an abandoned building, without care or comfort and, most likely, without ever being identified after their death. Having the pleasure and privilege of being John’s social worker taught me quite a bit about life and its value. More importantly, John finally gave me an ability to answer the question that so many had asked me regarding the housing first model – why? Now, I can easily say “because of John.” Without a housing first model, John would have never been identified for intensive case management and would have, most likely, continued to refuse care and treatment. And, though John was never able to move into his apartment, he died surrounded by people who loved and cared for him. John’s death could have been prevented. With early identification and intensive case management, John could have received necessary treatment and follow up that would have ultimately saved his life. That is why we believe in and practice a housing first model. I now carry a case load of individual’s who are struggling with AIDS, advanced cancer, heart disease, acute kidney failure, mental health and substance abuse, among a host of other medical and psychological diagnoses. Since I started working with HomeLink four months ago, I have buried two clients and am actively preparing for the death of a third. I realize, with every new person that I meet, that the investment in a housing first model will eventually move from providing compassionate end of life care to providing important interventional care that will allow for our client’s survival and reestablishment into the world. So, housing first is about ensuring survival, practicing compassion, and realizing our own imperfections. Jesse Jackson once said, “Never look down on another person unless you are helping them up.” Every day I know that, when I offer my hand, I am helping another person up. Why is what we do at Virginia Supportive Housing important? This blog was written by Stephanie M. Johnson, Housing Development Officer for VSH. The primary reason that anyone enters a career that is dedicated to ending homelessness is because they want to help others; I am no different. I have a great amount of respect for the homeless individuals that we serve. They are able to survive in extremely difficult circumstances that most of us cannot even imagine. Being able to provide a safe, comfortable, and supportive environment for these individuals is life changing. Not only do the residents have the opportunity to work with on-site support services and property management staff to stabilize their health and income but they also have the peace of mind of having a place to call home. Providing a permanent home opens a world of opportunities for individuals that were formerly homeless. For example, I recently met a resident that is reuniting with his family that he hasn’t seen since the time he became homeless 12 years ago. He now has a place that he is proud to have his family visit and is working on rebuilding these relationships. Permanent supportive housing is a proven, permanent solution to homelessness and provides residents with the opportunity to enjoy the present and look forward to their future. Not only are we providing a solution to homelessness but we are incorporating environmentally responsible design features into our apartment communities. Virginia Supportive Housing is designing buildings that reduce the impact on the environment by incorporating low-flow showerheads and toilets, Energy Star appliances and windows, mini-split HVAC system with programmable thermostats in each unit, and permeable pavers. The buildings have also started incorporating a solar thermal hot water system and a solar PV array to off-set the buildings electrical load. Housing Development staff also work with communities to get input on the design and siting of developments to ensure that the buildings are designed to blend in with the community and be located near public transportation, shopping, etc. to allow for greater independence. We constantly strive to improve the energy efficiency of our buildings and have been able to significantly reduce our impact on the environment while improving the quality of life for the residents. At Virginia Supportive Housing I get to be a part of something much bigger than myself. I get to meet some really amazing residents that inspire me with their resilience. I also have the opportunity to work with our partners in the community that are equally passionate about ending homelessness. Though the employees at Virginia Supportive Housing all have different backgrounds and provide different services within the agency, we all have one thing in common and that is the desire to end homelessness. Virginia Supportive Housing works to improve communities and the lives of our residents but in the end we all benefit from our work because a career is more rewarding when you are truly inspired by the mission that you are serving. This blog was written by VSH’s volunteer resources manager, Alison Jones-Nassar. For those of us who have never been homeless, I think it’s hard if not impossible to understand the complex mixture of feelings that is experienced by someone who has been homeless on the day their nightmare ends and they move into permanent housing. On Thursday, March 29, it was my privilege to witness one person’s private journey as she turned the key in the lock of her brand new apartment home. On the way to her unit, she stopped to admire every pristine detail, from the light fixtures to the paneling. It was as if she did not want to arrive too quickly, as if she was savoring every exquisite moment of anticipation. Her hands shook as she slipped the key into the lock and, as the door swung open, I suddenly realized I was taking part in a deeply intimate moment, both bitter and sweet in equal measures. It is not unusual for joy to express itself sometimes as tears, at other times as dancing. This new tenant erupted into both as she tentatively walked into the apartment, clasping her hands and rocking from side to side. The spacious room barely seemed able to contain her overflowing feelings of happiness and relief. Almost immediately, she threw open the window and took in the view below. What was she seeing? What was she remembering? I can’t say with any confidence why so much terrible misery exists in the world. Do all things really happen for a reason? Does everything truly happen “exactly the way it’s supposed to”, as we who are so blessed like to insist? All I know is that, if we can heal even a fraction of that misery by responding with kindness and compassion when the opportunity comes our way, then maybe there is redemption in that – for the ones who suffer and for us too. When I drove to Charlottesville that morning, I had no idea what the day held in store for me. I thought I would be taking a few photos and distributing some donations, but it turned out to be so much better. For that, I am the one who is thankful.